OUR 2019 CLASS LIST IS HERE! At School of the Alternative, our curriculum each year is determined by the radical individuals who apply, and the skills, experience, and ideas that they hope to share. We are really excited about the wild range of classes that we are able to offer this year! This means that now is the time to choose which week(s) you'd like to join us this year, and get those applications in! As a student at SotA, you will not only be a part of an engaging, community-minded group of folks (like you! ), you will also have the chance to both take classes and teach pop-up classes if you would like! The traditional student/teacher hierarchy is dissolved here at SotA, and we hope this non-traditional structure is just another great reason for you to apply this year! "SotA is the stuff of dreams! As someone who is not a trained visual artist or steeped in academia, it was incredibly freeing to be given the latitude to create, teach, explore, and just exist in such an incredibly nurturing environment. I feel reborn (no hyperbole here!) and propelled forward by oodles of love and acceptance. What a gift to have existed amongst such beauty and kindness." *we will accept applications after 3/1 until all spots are filled, but we do encourage getting your application in by the 3/1 deadline for the best chance of joining us this May! 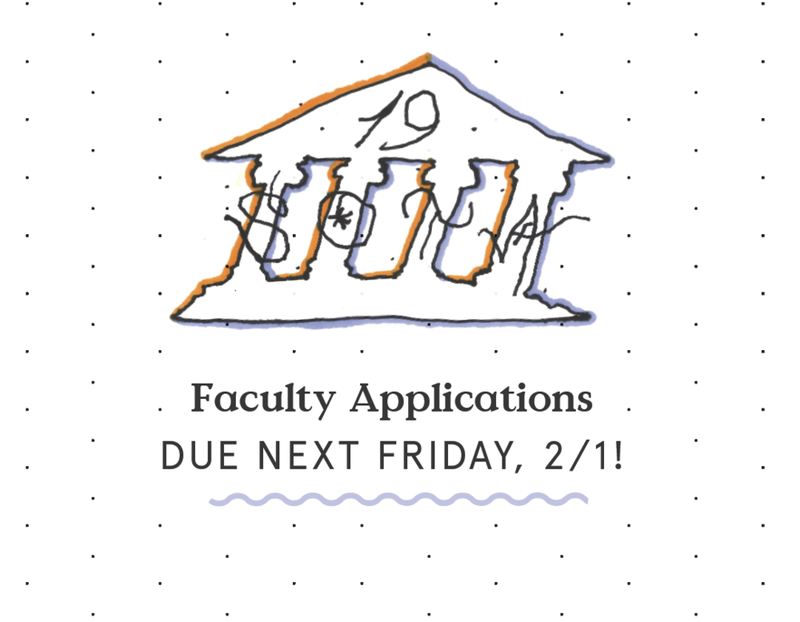 Our student, faculty, and scholarship applications for our 2019 session are now online! School of the Alternative is an experiment in education and community. SotA offers a socially integrated experience with intimate classes, communal living, and emphasis on shared labor. Instead of a traditional classroom environment, our campus supports a collectively built, self-directed approach to learning, which gives opportunity for all participants to learn and teach. Students can apply to come for 1, 2, or 3 weeks, and faculty can apply to come for 1 or 2 weeks. We will learn, work, and live together on the same campus originally used by Black Mountain College, doing work service in the mornings (cooking meals, setting up classrooms, cleaning, working in the garden, maintaining our archive), and taking or teaching classes all afternoon. *We will accept student applications after the deadline, and they will be reviewed on a rolling basis until all spots are full. We do recommend submitting your applications on or before the initial deadline. Learn more + access apps here! We aim to be accessible to anyone who wants access. We want to share our programming with all–regardless of race, sexual orientation, gender, income level, educational experience, or background. We value reciprocal education, wherein dialogue between peers, students, teachers, and community members creates space for all to learn. We are thrilled that you are interested in joining us this year! 2018 Session are STILL OPEN! We are still accepting applications on a rolling basis for our session this May! We are so excited about our fantastic class lineup, and we would love for you to join us for 1, 2, or 3 weeks! At School of the Alternative, we aim to provide a passion-driven model of education that encourages greater possibilities for thought, creation, and collective action. As a student, you will even have the opportunity to teach pop up style classes, and tuition includes all meals,+ 9 radical classes to choose from each week. We'll all live together in a lodge on a beautiful campus in Black Mountain, North Carolina, the original campus of Black Mountain College! At SotA, our current budget (funded through tuition from paying students) covers the cost of food, lodging, transportation (gas to and from airports to pick folks up), and operational expenses (storage unit, PO box, email, and website expenses). All supplies are donated, and all faculty and staff are working as volunteers. Monetary donations are prioritized for our deposit for 2019, stipends for faculty and staff, and class supplies. $$$ is not the only way you can help, though! We are also in need of basic art supplies, as well as additional kitchen supplies. Can you help us meet our 2018 needs? We are so appreciative of any donation, from $5 or a few packs of markers to $500 or a food processor, every donation is massively helpful! We are beyond thrilled to announce the class lineup for our session this coming May (11-30)! At SotA, we value passion-driven learning, and our curriculum each year is determined by the applications submitted. TAKE A LOOk at our 2018 class lineup! If you're interested in being a part of our community, we would love to see you apply as a student! At SotA, the line between student and faculty is blurred at best, with students even having the opportunity to teach pop-up classes, and faculty attending classes as students. Won't you join us for 1, 2, or 3 weeks in May? Our student, scholarship, and faculty applications for our 2018 session are now online! School of the Alternative is an experiment in education and community. We will all live, learn, teach, and work together for three weeks this May, in the magical mountains of Black Mountain, North Carolina. At SotA, through a system of co-education, learners and educators cooperate in actively producing knowledge and forming new aesthetic experiences. Faculty are free to plan their class according to their own instruction, and are encouraged to join other classes as students. Students are expected to design their own curriculum but are also given the opportunity to teach. All members will participate in the school’s physical maintenance through gardening, cooking, cleaning, and will contribute to the gradual and continual transformation of the educational objectives, essential values, and political concerns bracing School of the Alternative. We value experimentation as both an aesthetic drive, and as a way to push new ideas and old traditions to their limits. This radical power is one that allows for significant change – within us, our respective fields, our society, and our relationships with others. New Board Member! + New Acting Director! We have a new Board Member! We wanted to keep you all in the loop, and to be transparent about the working structures of the school. As you may know, we have a 5 person Board of Directors, and last year we had a student member as a rotating member of the board, the unspeakably great Luan Joy Sherman. It was a total delight working with him, and having him as such an integral part of our community this year. We've now filled that position with an incredibly passionate, energetic, and tirelessly hardworking community member, Nelle Dunlap! Nelle and her uniquely brilliant mind were a big part of making 2017 happen, and we are beyond thrilled to have her on board! We have a new Acting Director! Another pretty major shift that we've made is that I (Heidi Gruner) will now serve as the Acting Director of SotA. I've been involved with this project since the first planning sessions, and have served on the board since December of 2015. I have worked as an organizer, a curator and gallery director, and a graphic designer, and am endlessly passionate about this school, and the experience both during and between sessions. I am so so thrilled to take this on and to continue helping our community evolve into an experience that is impactful and transformative. My hope this year at school was to be an effective but invisible facilitator, and an active and engaged participant. It felt really exciting to struggle with and begin to become comfortable with that balance in my own way, and I hope to keep serving this community in a way that makes the experience even richer for everyone involved. Right now we're working to form working groups for the time between sessions, to further expand the community of people making SotA happen, and to continue to expand the scope of what we can do! Please do reach out if you want to be involved in any way, big or small!